Kauai is known for beautiful beaches as well as lush and tropical landscapes giving it the nickname of the "Garden Isle." Enjoy adventures on the ocean and land from the red-rocked Waimea Canyon to the green sea cliffs of the Na Pali Coast. A Kauai condo offers all of the comforts of home and the luxuries of resort living with close access to great dining, shopping and everything you need for an enjoyable and rejuvenating Hawaii vacation creating memories that will last a lifetime. Kauai offers many options for land, sea and air adventures with something for everyone. Zipline through a mountain valley or explore the backcountry on a horseback ride or ATV tour. On the ocean go snorkeling, kayaking or stand up paddle boarding. Enjoy a sunset sail, snorkeling cruise or boat tour along the Na Pali Coast. Sunny Poipu on the south shore is a great place for water activities as well as hikes along the scenic shoreline. On the north shore bird lovers will enjoy a visit to the Kilauea Point National Wildlife Refuge which is home to a historic lighthouse as well as numerous native Hawaiian bird species from albatross to nene geese. Views from the peninsula bluff are spectacular as this is the northernmost spot in the Hawaiian Islands. Drive along the north shore to visit Hanalei Bay and several more spectacular beaches as well as the Princeville Resort area which has two championship golf courses. See the ancient taro terraces at Limahuli Garden and Preserve, and beautiful topiary and sculptures at Na Aina Kai Botanical Garden. Enjoy a day hike. One of Kauai's most popular day hikes is the trek along the first two miles of the Kalalau Trail on the Na Pali Coast to Hanakapiai Beach. On the south shore enjoy the beaches of the "sunny Poipu" resort area, visit historic Old Koloa Town and tour the botanical gardens at McBryde and Allerton Gardens. Art lover will enjoy Friday "Art Night" in Hanapepe town featuring vendors, entertainment and many artists displaying their works. On the west side take a drive up along the rim of Waimea Canyon stopping at the lookout points for breathtaking views. At the top is Kokee State Park with miles of great hiking trails including canyon trails as well as routes along the coastal bluffs with great views of the famed Na Pali Coast, which you can also see on a boat or helicopter tour. On Kauai's east side you can see the impressive Opaekaa Falls and also the cascading Wailua Falls famed for being shown in the opening credits of the "Fantasy Island" television show. Take a riverboat ride up the Wailua River to see the renowned Fern Grotto with scenic views all along the way. After a day of adventure pamper yourself with a luxurious spa treatment, perhaps a beachside massage. Kauai is home to dozens of amazing beaches which are found along all sides of the island. On the north shore visit Hanalei Bay for a variety of water sports from surfing and stand up paddle boarding to kayaking and bodyboarding. Also on the north shore is Makua (Tunnels) Beach and Kee Beach, both known for their great snorkeling, and Anini Beach with crystal blue waters protected by an offshore reef. Just east of Anini is Kalihiwai Bay with expansive golden sands and a river meandering into the sea. Around the bend is Secret Beach known for its resident pods of spinner dolphins. Poipu Beach on the south shore is also a great snorkeling beach with sections that are good for bodyboarding and surfing. Lydgate Beach on Kauai's eastern coast has a well-protected area that is ideal for small children, and they will also enjoy the elaborate playground that was built at Lydgate through an impressive community effort. Polihale State Park on the western shore is home to sand dunes and an expansive stretch of beach that is one of the longest in the Islands. Excellent restaurants can be found all around the island of Kauai from Lihue and Kapaa on the east shore's "Coconut Coast" to Poipu Resort on the south shore and in the charming north shore towns of Kilauea, Hanalei as well as Princeville Resort. Lihue is Kauai's main commercial center with dozens of restaurants from fast food and casual fare to fine dining. Another great place for dining on the east shore is Old Kapaa Town where you can find live music in the evenings at various restaurants along with a range of cuisines amid the historic buildings. 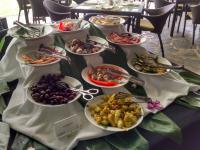 In Poipu on the southern shore you can find some exceptional upscale seaside dining at the resort hotels as well as casual and family fare at various local eateries. The nearby Shops at Kukuiula has two exceptional restaurants, Josselin Tapas Bar & Grill and Merriman's Kauai, as well as the Living Foods Market & Cafe. They also host the festive Kauai Culinary Market every Wednesday afternoon with dozens of farmers and food vendors. On the north shore dine at the St. Regis Princeville overlooking Hanalei Bay or head down into Hanalei town to choose from numerous venues including a sophisticated meal of tapas and fine wine at Bar Acuda. To meet Kauai's local farmers and get some fresh fruit and vegetables as well as delicious prepared foods visit the local Sunshine Markets (Farmers Markets) held all around the Island, each one on a different day. Kauai has a range of shopping opportunities from art galleries and upscale boutiques to hand-crafted works by local artisans for memorable souvenirs of your visit. Explore the shops of Old Koloa Town on the south shore and nearby Poipu Resort area with shops at the resort hotels, Poipu Shopping Village and the newer Kukuiula Village Shopping Center. Nearby Hanapepe town is an arts hub and hosts "Art Night" every Friday evening with vendors, live music and galleries staying open late for the event. Lihue on the east side is Kauai's commercial center and home to the Kukui Grove Shopping Center as well as large chain stores including Costco and Walmart. Also on the east side's "Coconut Coast" is Wailua and Old Kapaa Town with many interesting shops and art galleries amid the historic plantation era buildings as well as several medium-sized shopping malls. On the north shore browse the many shops and art galleries in charming Hanalei town, Princeville Resort and Kilauea town. A rental car is recommended when staying in your Kauai condo so you explore the island's many beaches and attractions from Hanalei Bay and Princeville on the north shore to Poipu Resort on the south shore and Waimea Canyon on the west side. Kauai's public bus system operates 7 days a week and provides service between most major communities. Kauai weather is generally very pleasant all year around with winter being the rainier season, particularly on the northern shore. The west and south shores of Kauai are generally a bit warmer and drier than the north and east shores with rain showers typically passing quickly revealing sunny blue skies and rainbows. Ocean conditions vary through the seasons with the north shore typically very calm in the summer months and great for snorkeling and other water activities, while the winter months intermittently bring high surf and strong currents on northern shores. South swells sometimes arrive during the summer months bringing bigger waves along southern coastlines. On most days you will likely be able to find just the right beach for your ocean activities with some beaches being more protected from the open ocean. For swimming and water sports it is best to visit lifeguarded beaches and check with water safety personnel about the safest places for the activities you choose. We offer Kauai condos in all of the island's finest areas from the lush and verdant north shore to the east side's Coconut Coast and Poipu Resort on the south shore. Please browse through our rental listings to get an understanding of the different amenities and property features we offer. Our goal at Hawaiian Beach Rentals is to provide you with a with an unforgettable place to stay for your Hawaii vacation. On Kauai's sunny south side you can enjoy a Poipu condo near exceptional beaches and resort amenities. Stay in a Princeville condo on the north shore taking in stunning ocean views from the bluffs above Hanalei Bay, or at an eastern shore condo with more great beaches and close access to great shopping, dining and entertainment. Hawaiian Beach Rentals takes pride in having the largest selection of high-quality Kauai condos and we stand behind our product, listing only the best properties on our site. If you have any questions about our Kauai condominiums or which area is best for your Hawaii vacation please give us a call and we will be happy to assist you. See below for an overview of some of Kauai's finest condo resorts. Kauai has a rich history from ancient times through the eras of Kauai royalty, early explorers, American missionaries, the sugarcane industry and modern tourism development. It was on Kauai that British Captain Cook first came in contact with the Hawaiian Islands in 1778 when he stepped onshore at Waimea Bay. You can now see a statue of him in the center of town. Many historic structures have been preserved on Kauai including ancient heiau (Hawaiian sacred sites) and also buildings from the missionary era including the 1836 Waioli Mission House in Hanalei town. Hawaii's first sugarcane plantation was started in Koloa on the south shore. You can learn more about Kauai's history along the self-guided Koloa Heritage trail where informational plaques provide more information about important landmarks along a ten-mile route. Kona Kea Hotel & Resort is a luxury boutique oceanfront hotel at Poipu Resort on Kauai's south shore. Amenities include a fitness center, free high-speed internet, valet parking, concierge services, housekeeping, swimming pool, pool bar, spa, sundries/gift shop, water sports rentals and business center as well as the Red Salt Restaurant and the Spa at Koa Kea. Kuhio Shores Condos offers one and two bedroom condos on the beach in Poipu Resort on Kauai's sunny southern shore. Amenities include full-size kitchens, oceanfront lanais, free internet and parking. Close to great shopping and restaurants including seaside dining at Beach House Restaurant next door. Poipu Kai Resort is located on Kauai's south shore in sunny Poipu Resort. Set on 70 lushly landscaped acres, Poipu Kai includes the Makanui, Manualoha, Regency, Kahala and Poipu Sands complexes. Garden paths lead to Poipu's beautiful beaches including Shipwreck Beach and Brennecke's Beach. Vacation condos have private lanai for the ultimate in indoor/outdoor living. Amenities include swimming pools, Jacuzzi spas, nine hard and soft tennis courts, restaurant and beach equipment rentals. Regency Poipu Kai is located in the south shore's prestigious Poipu Kai Resort offering spacious accommodations with one to four bedrooms. Amenities include two swimming pools, two hot tubs. 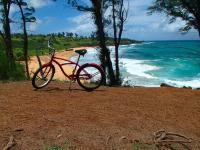 Close to great beaches including Poipu Beach Park and Shipwrecks Beach. The Villas at Poipu Kai are located at Poipu Kai Resort offering garden villas with from two to four bedrooms and poolside villas with three or four bedrooms. This boutique resort offers a gourmet kitchens with state-of-the-art appliances and granite countertops, hardwood flooring and expansive lanais with ocean, mountain and pool views. Amenities include a swimming pool, fitness center, high-speed internet, free parking, tropical landscaping, air conditioning. Close access to golf, tennis, dining, shopping and beach activities. 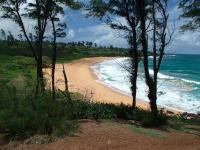 Waipouli Beach Resort is located on Kauai's "Coconut Coast" on the eastern shore. Amenities include kitchenettes, business center with internet access, free WiFi and parking, a fitness center, swimming pool, and beachfront restaurant and bar called Oasis on the Beach.The premier pool features water slides, waterfalls and child-friendly areas. Pamper yourself with a variety of treatments and massages at the beachfront Aveda Spa. Very close access to great beaches, dining and shopping including Kauai Village Shopping Center and Coconut Marketplace. Wyndham Kauai Beach Villas are located just north of Lihue on Kauai's east shore. This beachfront resort has an outdoor swimming pool, hot tub, two tennis courts, and a picnic and barbecue area. Close access to great shopping, dining and championship golf courses. Kauai Marriott Resort is located in Lihue on Kauai's east shore on beautiful Kalapaki Beach. Amenities include a fitness center, bar/lounge, restaurant, activities for children, business center with internet access, shuttle bus service and large, family-friendly swimming pool. Pamper yourself at the on-site Alexander Spa and Salon. The Kauai Marriott Resort has recently undergone major renovations. The adjacent Kauai Lagoons Golf Club provides world-class golfing. Outrigger Kiahuna Plantation is located on the Poipu oceanfront on Kauai's sunny southern shore. Outrigger Kiahuna Plantation sits on a 35-acre beachfront property and offers one and two bedroom condos with full kitchens. Amenities include free high-speed internet, tropical landscaping including orchid gardens, the on-site Plantation Gardens Restaurant as well as other fine dining close by. Poipu Village Shopping Center is within walking distance and Kiahuna Golf Course across the street. Whalers Cove Resort is located in Poipu Resort on Kauai's sunny south shore. A three-minute walk away is the child-friendly Baby Beach. 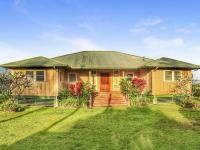 Panoramic views including great ocean views from lanais. Amenities include tropical landscaping, oceanfront pool, spa hot tub, barbecue area, free parking and lava-rock shower. Close to great golf, dining and shopping including the upscale Kukuiula Village Shopping Center. The Outrigger at Lae Nani is a low-rise enclave located in historic Kapaa town on Kauai's eastern shore known as the "Coconut Coast." One and two bedroom condo units feature full kitchens with amenities including a fresh water swimming pool as well as a saltwater wading pool, tennis court and free parking. Outrigger at Lae Nani has close access to great dining and shopping in Kapaa town and Wailua as well as beautiful beaches for water activities. Also nearby is the municipal, oceanfront Wailua Golf Course. Pono Kai Resort is located in Kapaa town along Kauai's famed "Coconut Coast" on the eastern shore. Amenities include fitness center, business center with internet access, free parking, tropical landscaping, tennis courts, two putting greens, croquet, bocce ball, volleyball and shuffleboard courts, and a swimming pool, hot tub and sauna. An activity desk at the front counter provides beach equipment rentals. Wailua Bay View vacation condos are located on Kauai's east shore along the renowned "Coconut Coast" just steps from the beach. Condos have one bedroom and one bathroom, full kitchen, washer/dryer, private lanais, ocean views and linens including beach towels. Amenities include swimming pool and barbecue area. 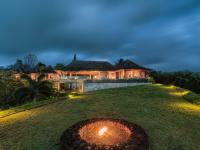 Close access to golf as well as dining and shopping in Wailua and Kapaa towns. Hanalei Bay Resort is located on Kauai's north shore on 22 acres overlooking scenic Hanalei Bay and the north shore mountains. Amenities include two swimming pools, hot tub, eight tennis courts, free parking, tennis pro shop, restaurant/bar, lounge, beach access, housekeeping options, tropical landscaping, laundry facilities, water sport rentals, in-room massage service, ice machines and free internet access. Golf cart shuttle service provided to the beach which is a 6-minute walk away. Hanalei Colony Resort is a beachfront resort located on Kauai's scenic north shore. Two bedroom, two bath condos have complete kitchens. Amenities include free parking, activities for kids, a business center with internet access, shuttle bus service, swimming pool and hot tub. Close access to a gourmet restaurant and day spa as well as some of Kauai's finest beaches. Sealodge is located in Princeville Resort on Kauai's north shore on a seaside bluff overlooking the blue Pacific. Sealodge offers one and two bedroom condos with full-size kitchens and private, covered lanais. Close access to the resort amenities of Princeville Resort including beaches, golf, dining and shopping with Hanalei town and bay just down the road. Cliffs Resort is located in Princeville Resort on Kauai's north shore on an oceanfront bluff with stunning vistas of the blue Pacific as well as the verdant north shore mountains. Amenities include a swimming pool, jacuzzi, activity center and tennis. Close by our Princeville's world-class golf courses as well as shopping and dining at the St. Regis Princeville Hotel, Princeville Shopping Center and Hanalei town. The Plantations at Princeville is a newer condominium resort located on Kauai's north shore in Princeville Resort offering two and three bedroom, air-conditioned units. Amenities include a waterfall pool, exercise room and free parking. Close to golf and tennis as well as great dining and shopping including the Princeville Shopping Center with Hanalei town and bay just down the hill. Please browse through our listings in the following condo rentals on Kauai. In the Poipu Resort area are Poipu Shores Resort, Poipu Kapili Resort, Honu Kai Villas, Manualoha at Poipu Kai Resort, Kuhio Shores, Kahala Resort, Kauai Beach Resort, Kaha Lani Resort, Koloa Landing at Poipu Beach Wyndham Grand Resort, Poipu Kapili Resort Condos. Also in Poipu are the Poipu Makai, Regency at Poipu Kai, Makahuena, Whalers Cove Resort, Poipu Shores Resort, Aston at Poipu Kai Resort, Manualoha at Poipu Kai Resort, Villas at Poipu Kai, Regency at Poipu Kai, Pane Makai Beach House Dolphin Suite, Poipu Sands at Poipu Kai Resort, Outrigger Kiahuna Plantation, Nihi Kai Villas, Makanui at Poipu Kai Resort, Lawai Beach, Poipu Crater Resort, Poipu Shores, Poipu Palms. In the Kappa/Wailua region see Waipouli Beach Resort, Pono Kai Resort, Outrigger at Lae Nani, Plantation Hale Suites, Kapaa Shore Resort, Kaha Lani Resort, Outrigger Waipouli Beach Resort, Aston Islander on the Beach, Coconut Grove Apartment at Village Manor and Outrigger at Lae Nani. In the Princeville Resort area, Alii Kai Resort, Kamahana, Pali Ke Kua Resort, Mauna Kai Condos, The Cliffs at Princeville, Puu Poa at Princeville Resort, Plantation at Princeville, Orchid Point, Hanalei Bay Resort, Hanalei Bay Villas, Sandpiper Village, Nihilani at Princeville, Villas of KamaliiSealodge at Princeville, Emmalani Court, Puamana and Villas on the Prince.